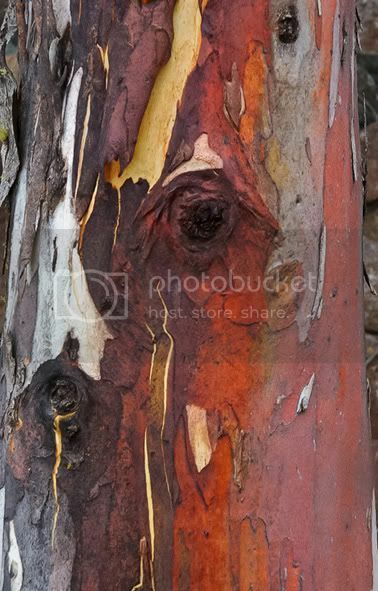 Bushwalk Australia • View topic - An interesting look at trees. An interesting look at trees. Re: An interesting look at trees. All good things are wild, and free. 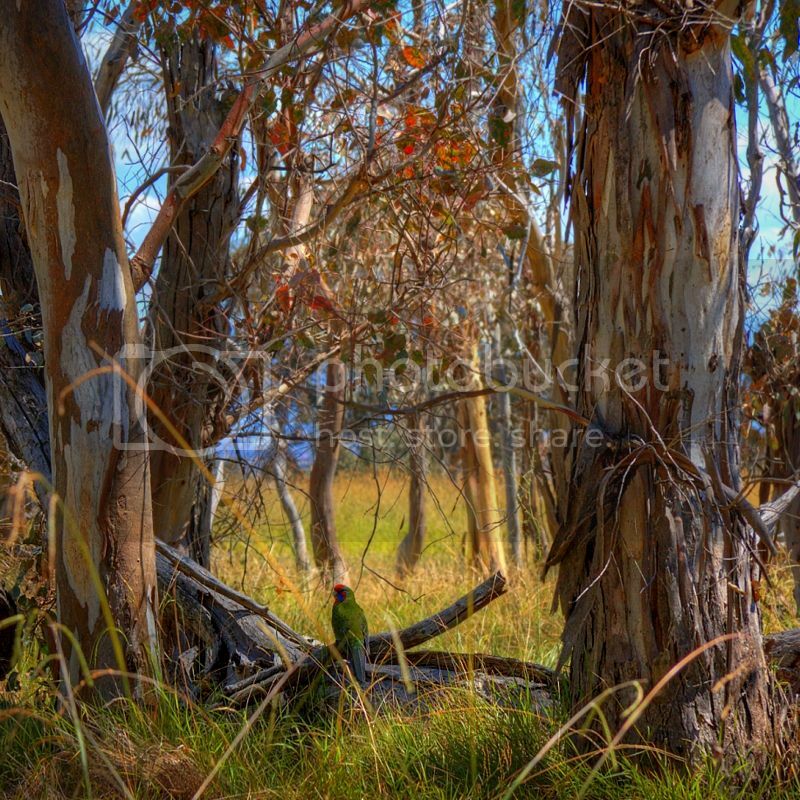 Manna Gums (aka Ribbon Gum, White Gum or Viminalis) and a juvenile Crimson Rosella, in an open woodland, Bicentennial National Trail, the Northern ACT Border. 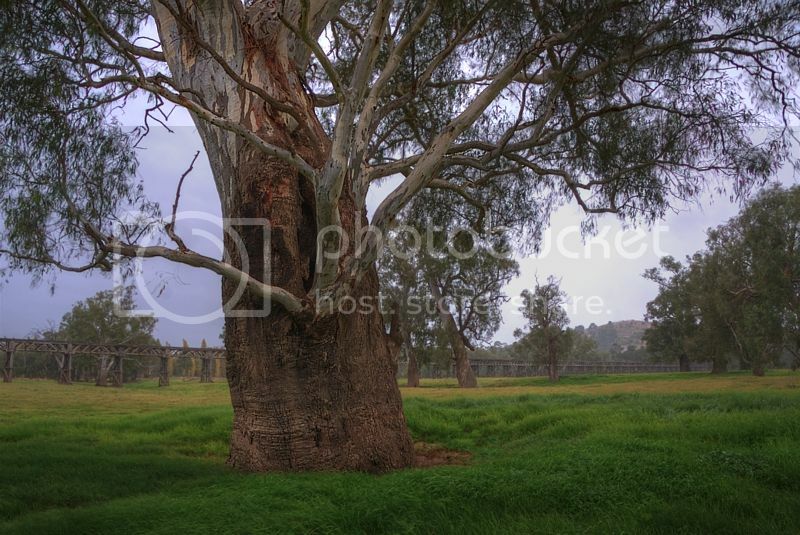 River Red Gums, on the floodplains of the Murrumbidgee River in the Eastern Riverena. Location: Adelaide, dreaming up where to go next. Serious OH&S issues there... Seriously big tree too! Before the realignment of the road in Coffs Harbour where the Big Banana is or was, there was near the Big Banana then, a monument to a Mountain Grey Gum that was felled in the district. I can't remember the exact wording on the plaque but it was something like this; From this one tree was harvested the timber to build the frames of 1,320 Sydney houses, frames for 72 double story houses. Two, two story hotels and 2,300 railway sleepers. 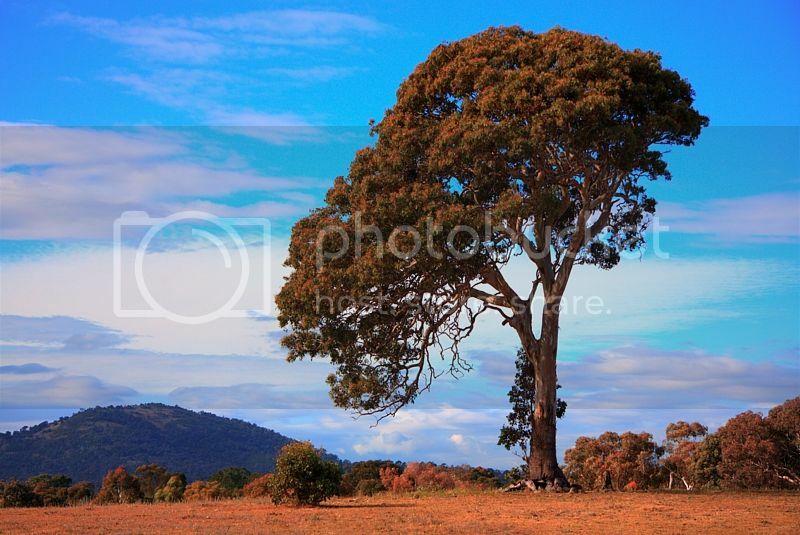 That Mountain Grey Gum must have been a very impressive tree with good limbs as big as large trees. 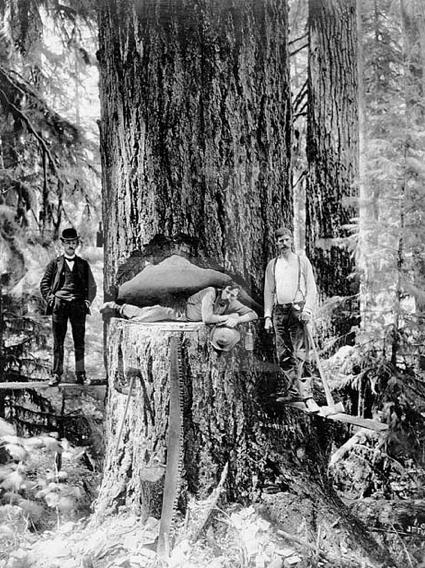 How could one imagine the board-foot of lumber harvested from that monster above? Great photo. Those two smaller Redwoods were probably being knocked over to get at the big one. 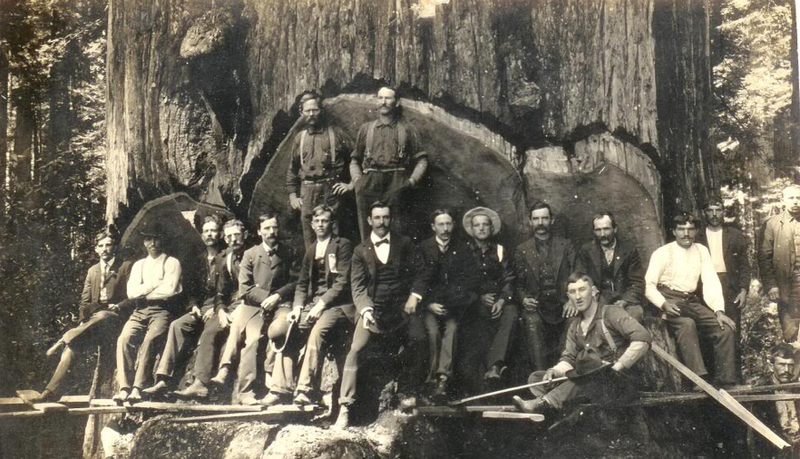 That sort of thing happened here in Oz too and the logs were left on the ground ... logs which can be still found in the salvage timber merchants yards in Northern NSW. Great time of year for these gums. 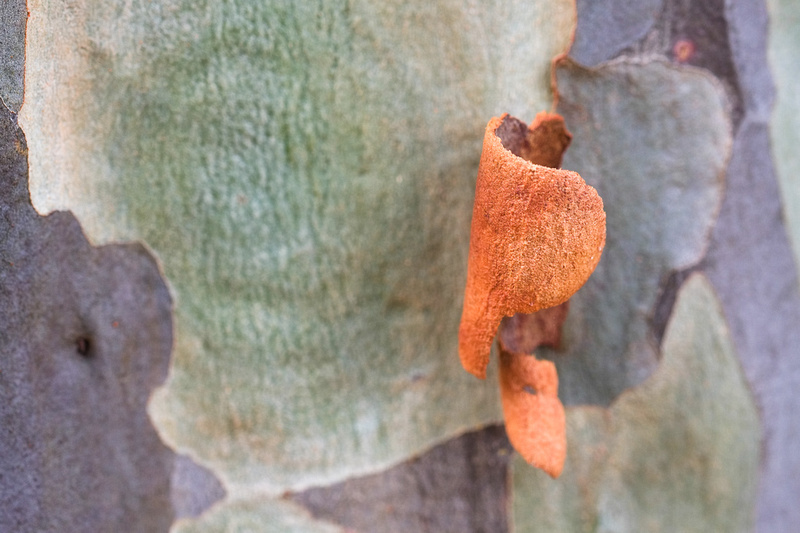 I _think_ this is a spotted gum, but not an expert. hahaha oh man how did that not get modded...... seriously good!! The Australian Cypress 'Callitris' of which there are 14 species, are commonly called White Cypress or incorrectly, Cypress pine. 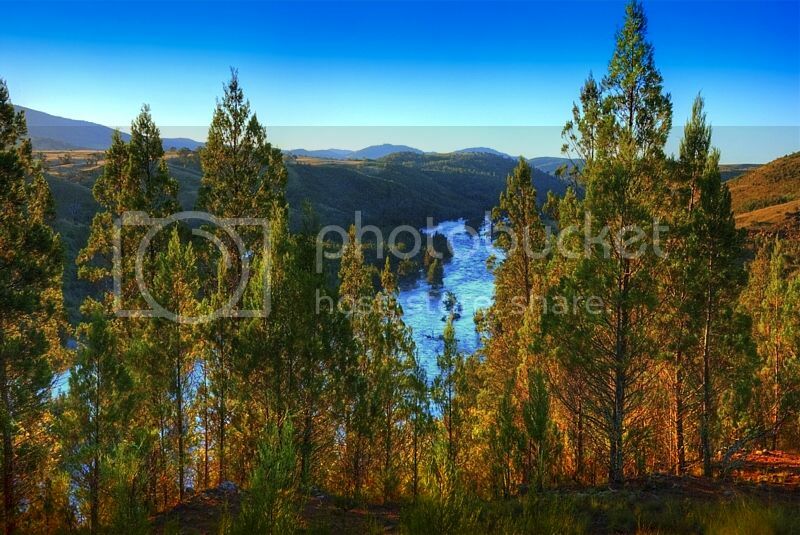 At Woodstock Nature Reserve above the Murrumbidgee River is the largest stand of Black (Callitris endlicheri) and Blue Cypress (Callitris glaucophyla) growing in association, now remaining in the ACT. During the fire storm of 2004, the firefighting sky cranes Big Elvis and Memphis Belle water bombed Woodstock around the clock. Woodstock would have been totally decimated if they hadn't. 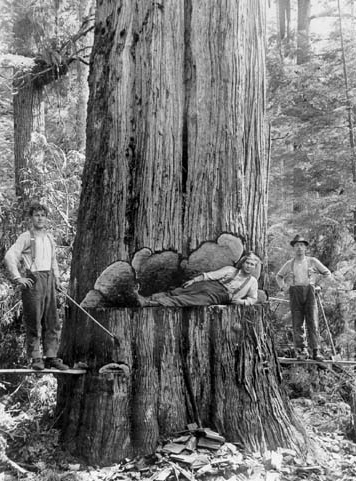 As it was, most of the large trees were lost. Fire scientists calculated that the Canberra fire storm, had the force of 60 Hiroshima bombs. It took several days to put the fires out at Woodstock because of flair-ups. I thought that the forest at Woodstock would not recover after basically disappearing. The forest isn't a patch on what it once was, because the big trees on the western slopes and on top of the ridge were destroyed ... but the forest is certainly coming back. After the fire. In places the ash was 30cm deep and looked just like fresh snow, photo bottom right. 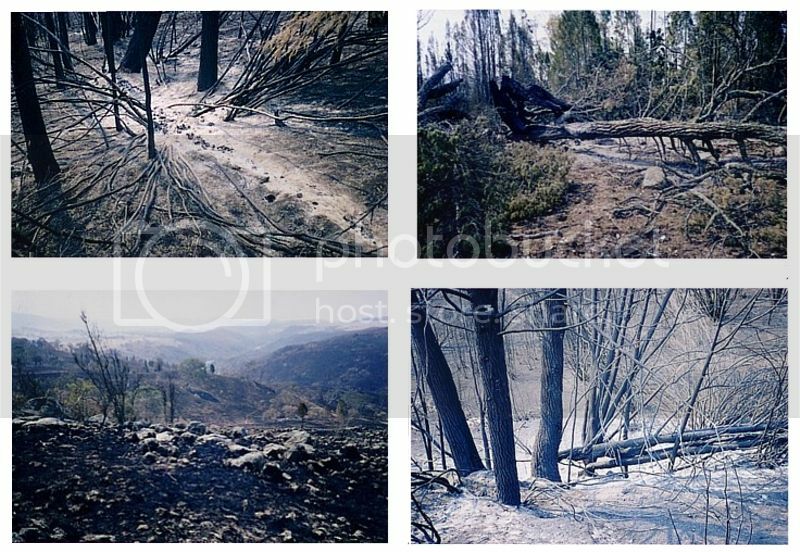 The biggest trees disappeared, not even their stumps remained because of the intensity of the fire, photo bottom left. 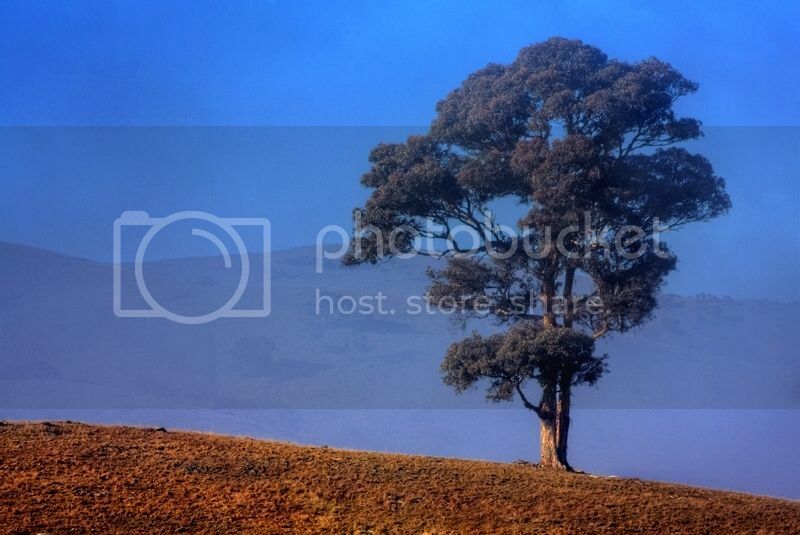 I visit Woodstock in the NW of the ACT often, it is close to my home, just a few minutes away. It has been fascinating seeing the forest come back to life. Very slowly at first but now its getting it together. There are thousands of Cypress seedlings, thanks to the regular rain. Some shots from the last few weeks. Last edited by WarrenH on Wed 28 Mar, 2012 5:33 pm, edited 1 time in total. Magic photos Warren. Great to see the Callitris forests are recovering. Callitris can take a long long time to grow to a decent size, especially when regenerating and seedlings/saplings grow into dense thickets. 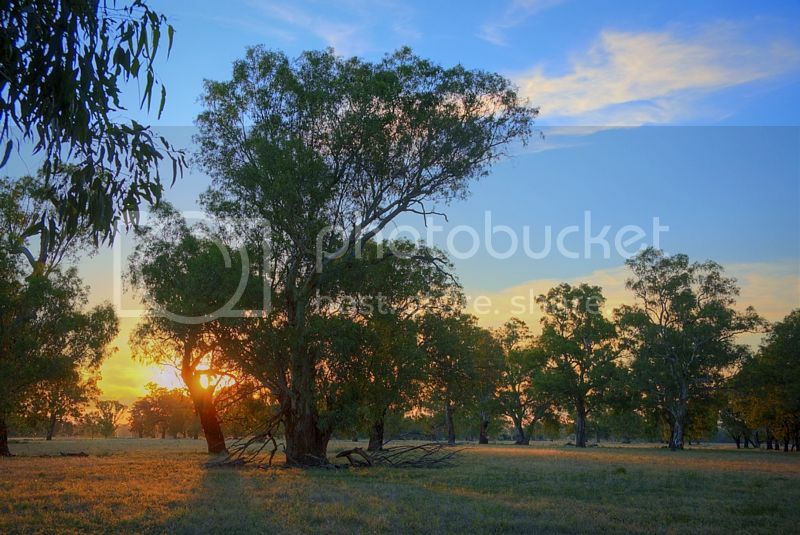 In areas like the Pilliga Scrub and though to Qld, the big old trees are mostly gone through harvesting, but there are still a few very large trees about if you know where to look. Pteropus, thank you for your comments. I'm pleased that you like the shots. I certainly know what you mean about the Callitris, forming thickets. If many of the seedlings survive, the trees will look like they've multiple trunks because they've sprouted closely together. I avoided using the word sapling because there are many saplings to each metre (in places), far too many, to even guesstimate. Recent images from another unfortunate occurrence. Not unfortunate for the natural landscape of course. 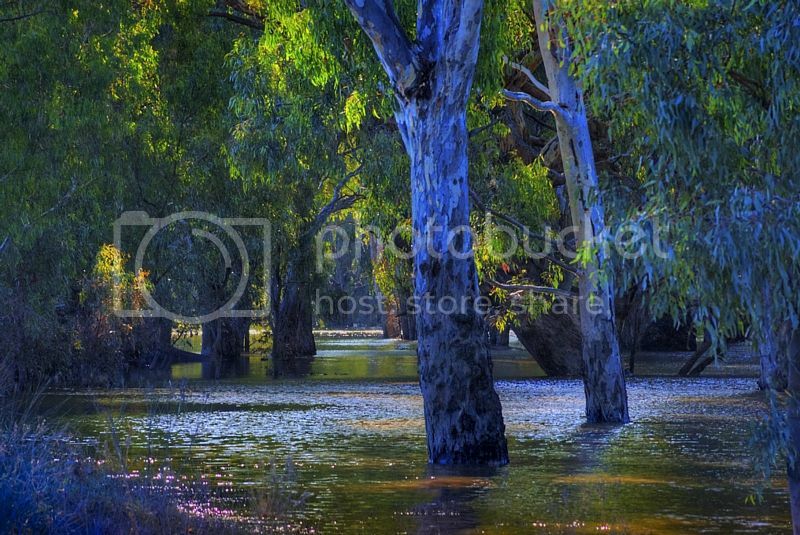 The natural landscape benefits greatly from flooding but certainly unfortunate for those who built the 600 homes on the Murrumbidgee floodplains to the NW of Wagga Wagga at Gumly Gumly and North Wagga. 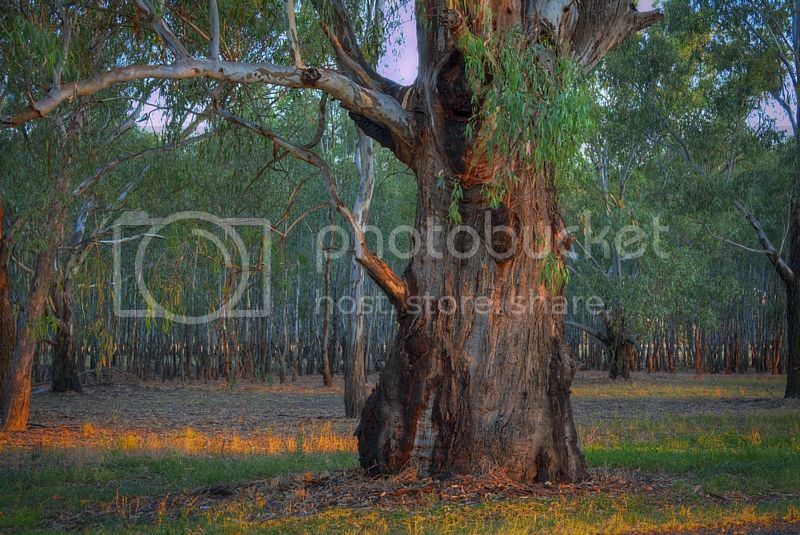 A River Red Gum up-to its waist in water, early twilight. 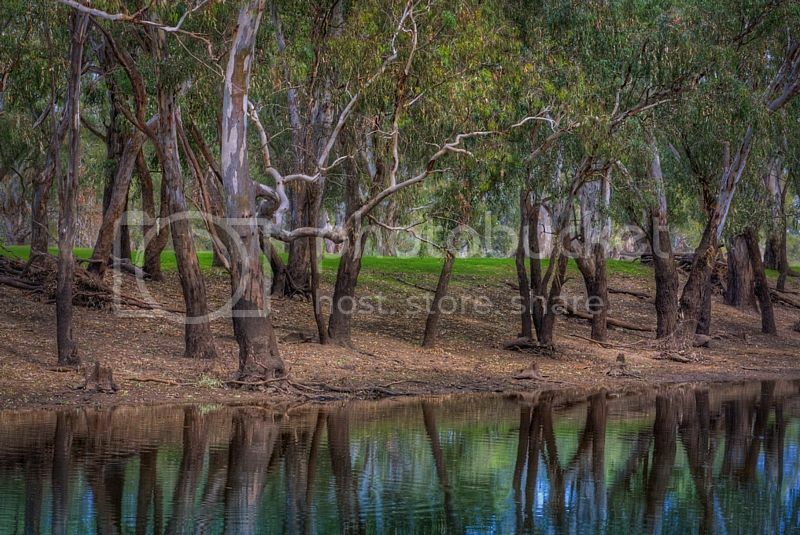 I took the photo at Eunony Lagoon, NE of Wagga Wagga. A bizarre egg in a nest ... at Dukes Creek. 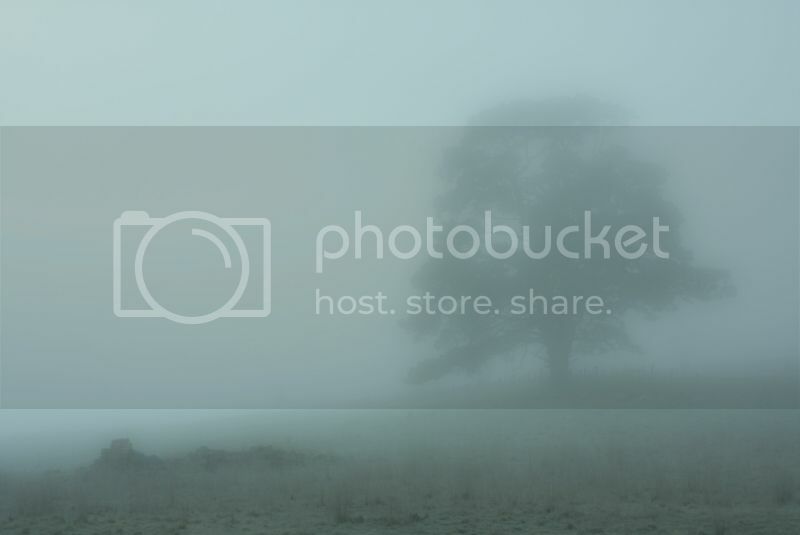 The weather is described by trees. 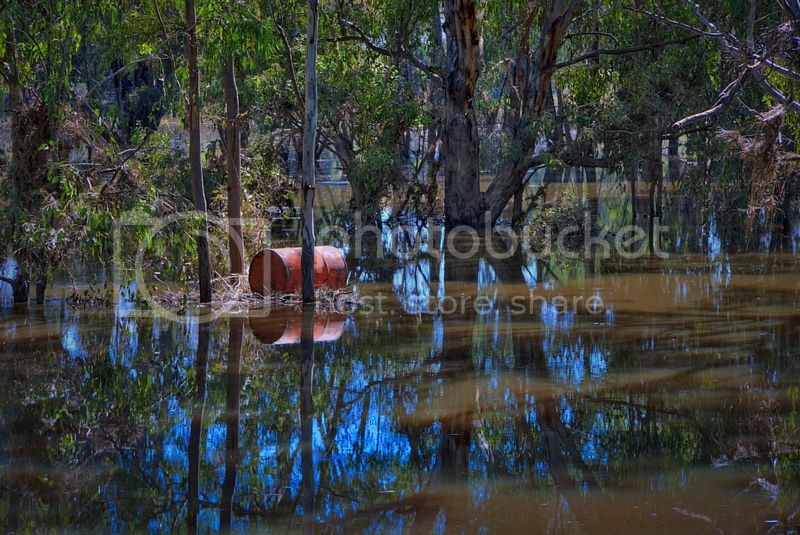 Signs of flooding left on River Red Gums ... Gobbagombollin Lagoon, on the floodplain of the Murrumbidgee River, NSW. 16 years of water stress and 3 years of good rains are well described by the Australian Cypress, in the Murrumbidgee River Corridor, ACT. 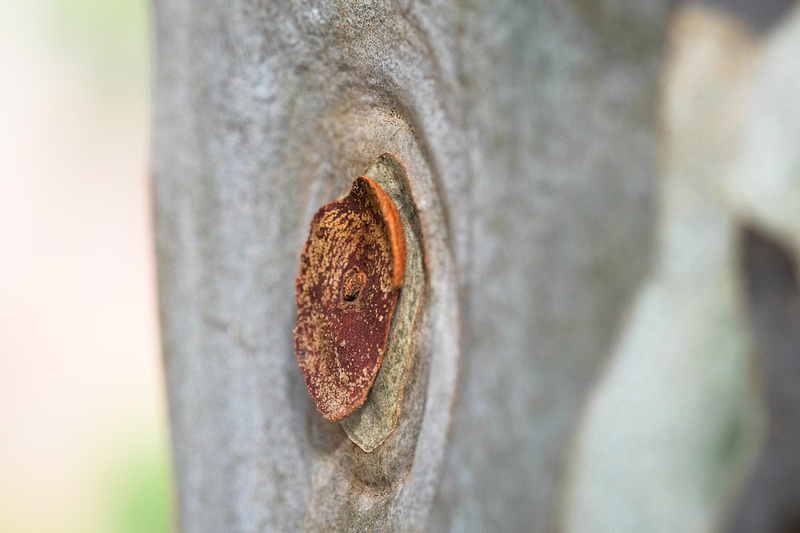 How about something interesting from a tree? If common sense is so common, why don't you see more of it? New gum swollowing the old gum. 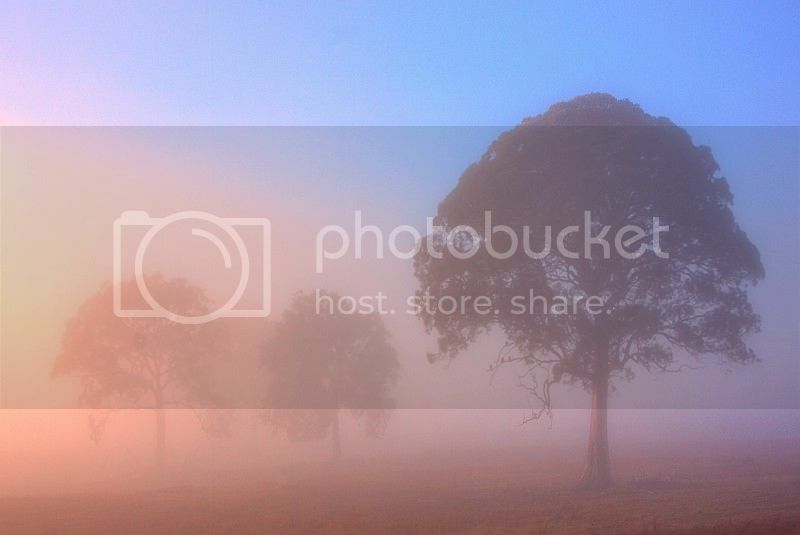 A giant River Red Gum and the old wooden railway viaduct on a rainy day, river mist and a red start to the day. 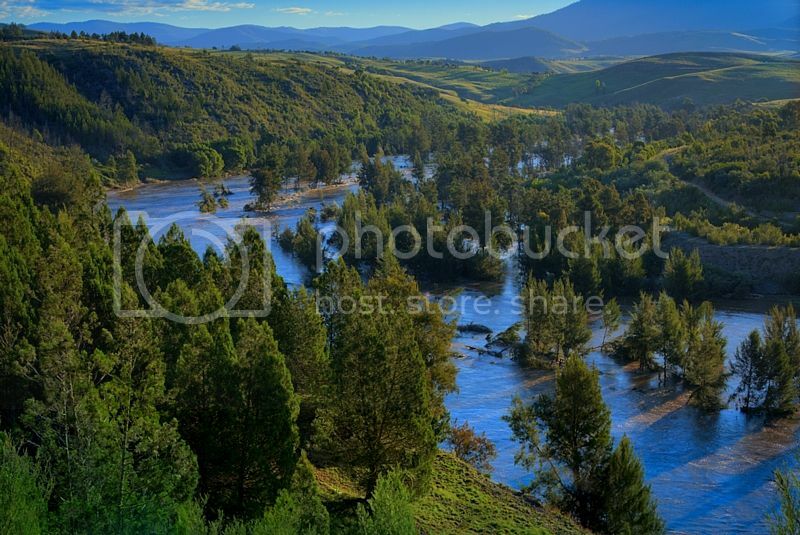 The Murrumbidgee River flood plain on the SW Slopes of NSW. 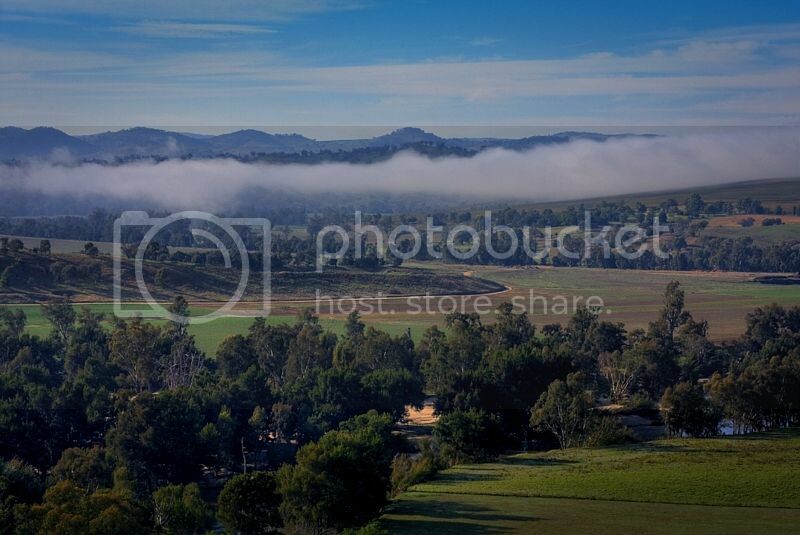 Walking on this precious swathe of Crown Land, particularly the corridor of the Gundagai Common was stunning. As stunning as the giant gums ... I did a walk 4 weeks after the record flood (of early March ), which was greater than the famous 1856 flood. It was like being on a movie set. There were volunteers mending fences, graziers and farmers clearing debris and moving their stock, while shire workers graded the tracks. I chatted to several farmers and graziers and volunteers. They were all happy to tell me their stories about how they survived the flood and they identified the tree species when I quizzed them. 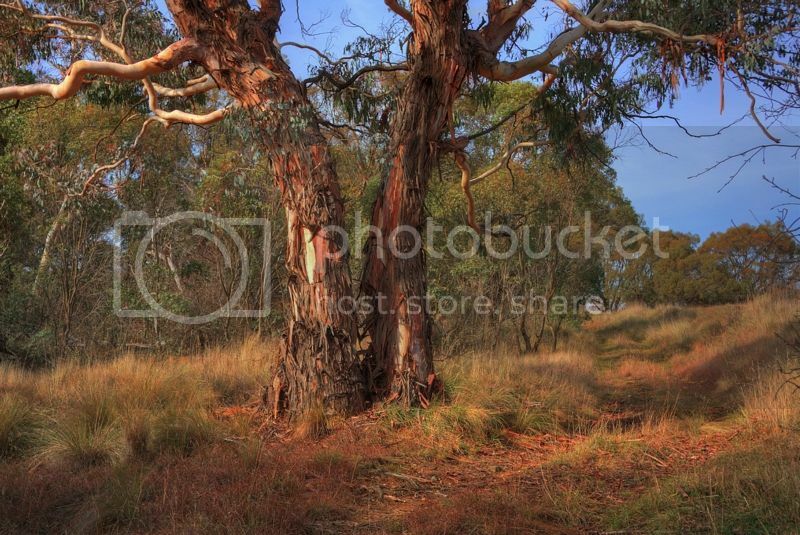 A large Blakely's Red Gum and Mount Taylor ... Bicentennial National Trail, in the west of the ACT. Riverside walk @ Cahills Crossing, Kakadu N.P. Stumbled upon this knobbly specimen while walking a number of tracks on my rostered day off. Last edited by ofuros on Thu 17 Jan, 2013 9:31 am, edited 1 time in total. Mountains view are good for my soul...& getting to them is good for my waistline ! Thanks for the all the pics. Many bring back wonderful memories. 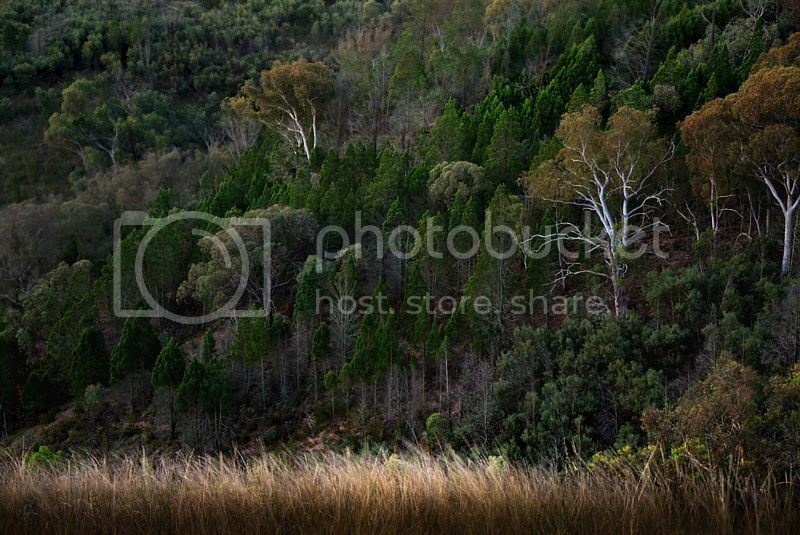 Especially the Grass Trees at The Pinnacle, lived not far from there for about 12 yrs, don't think the wife has ever forgiven me for leaving the area. The stand of Antarctic Beech not far from there are also something special. Some great photo's in this thread. 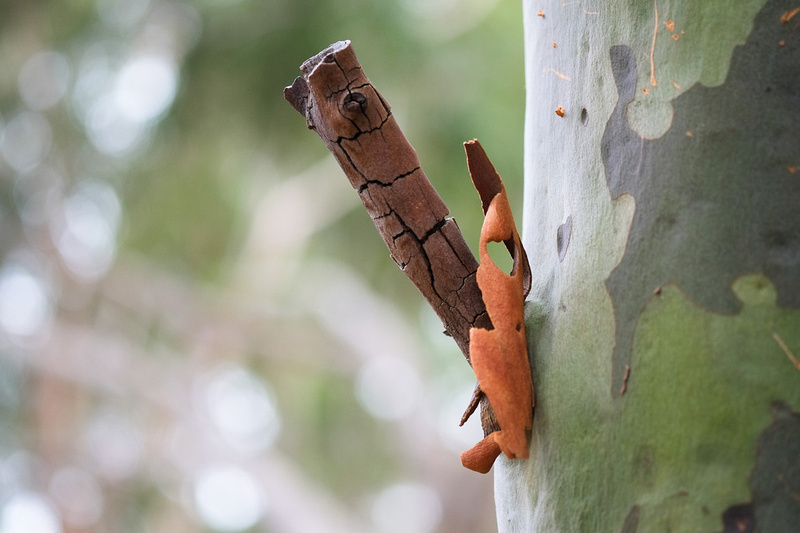 Thought I'd add an interesting 'spotted gum' we found out at Chaelundi National Park in northern NSW. 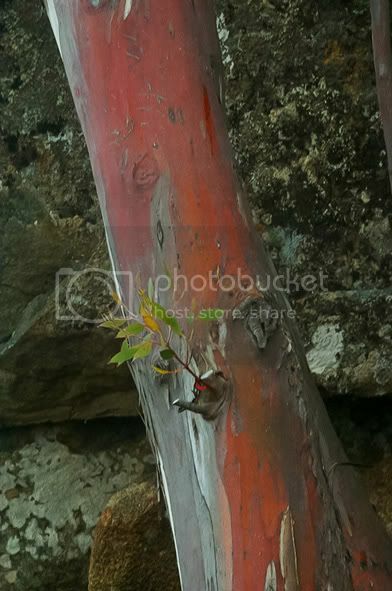 awildland wrote: Thought I'd add an interesting 'spotted gum' we found out at Chaelundi National Park in northern NSW. Awildland, G'day, very interesting indeed. I've seen things like rocks embedded in a tree, and bits of old farm machinery ... but I've not such an amazing encroachment by nature. 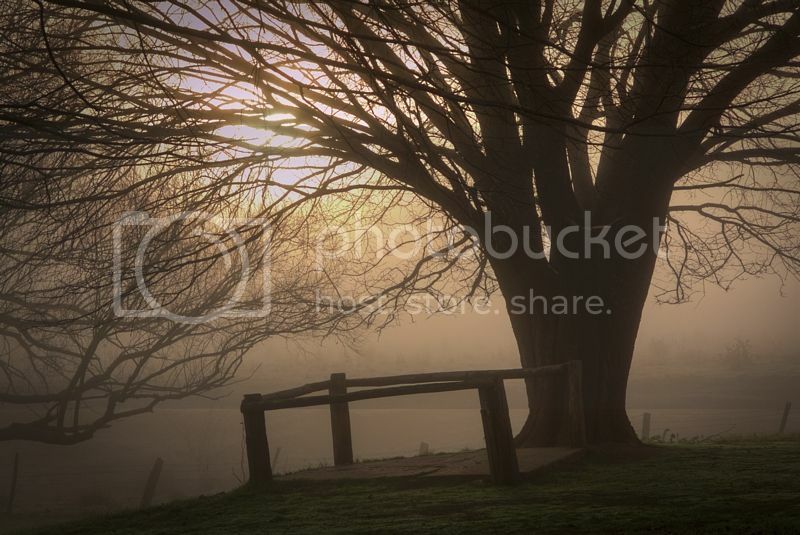 I've not been on this site for a while but I've kept enjoying the landscape, particularly looking at trees. I did a few kilometres along the Great Dividing Range over winter. I would have gone further but every wet river and creek crossing imaginable was flooded ... and stopped me moving for days at a time. Anyway, please enjoy a few shots from the ridges and high plateaus of the Great Divide, on or beside the Bicentennial National Trail. 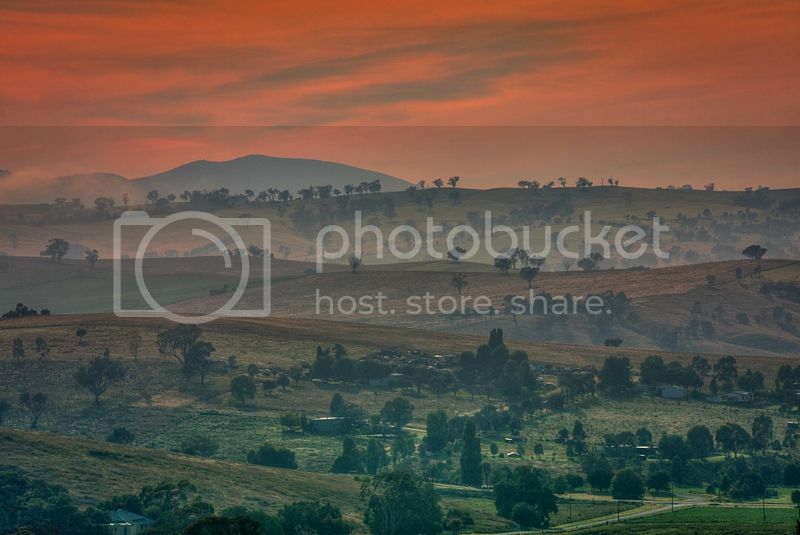 From the Talliasen Hills and the Turrilo Range in Tallaganda NP North to Waiborough Creek, at the southwestern ridges of the Greater Blue Mountains NP. Shots to accompany the above post. 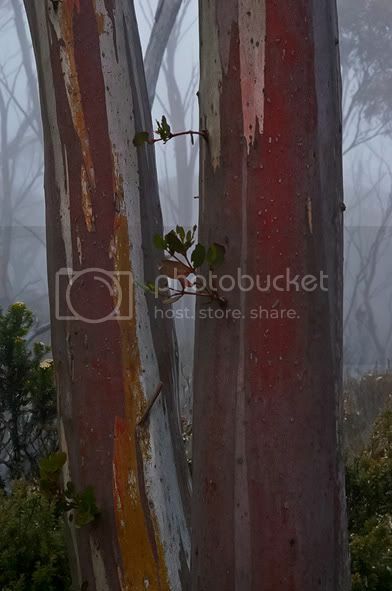 A Mountain Grey Gum and lifting fog, on Molonglo Ridge in the Taliesen Hills, above the Eastern foreshores of Googong Dam. Dawn and Blakleyis at Woolcara. 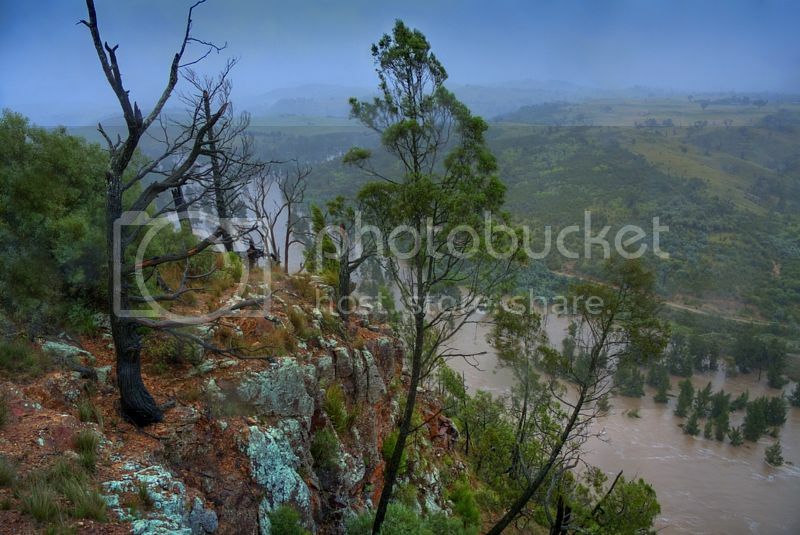 Heavy rain, and Monterey Pine near Corroborree Hill, in the Upper Lachlan. The stone ruin is though to be a hut for one of Governor Macquarie's convict laborers, settled when Taralga was being built. 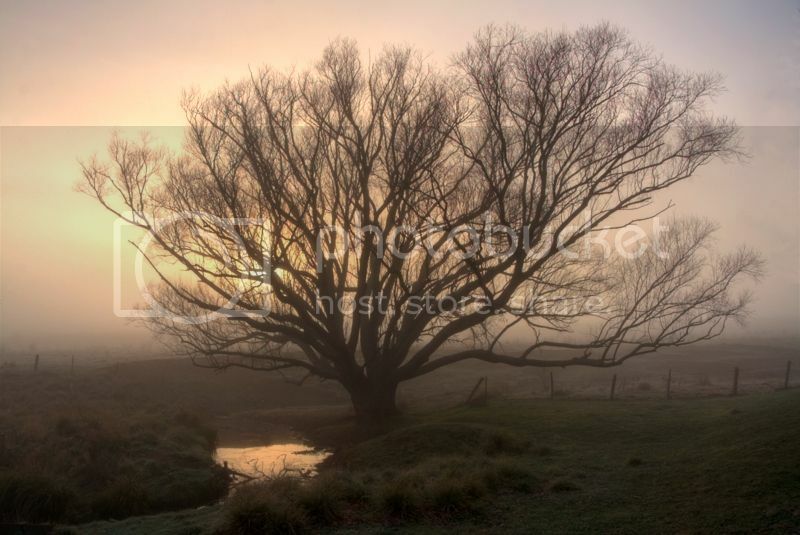 A giant Elm, on on Corroboree Creek, an upper reach of Waiborogh Creek, the BNT. A Royal Oak and a humble horse wash, at Taralga, on the BNT. Montereys at Hogans Flat, ot the edge of Mares Forest NP, the BNT. Broad Leaf Peppermints at Broken Bridge Traveling Stock Reserve, the BNT. 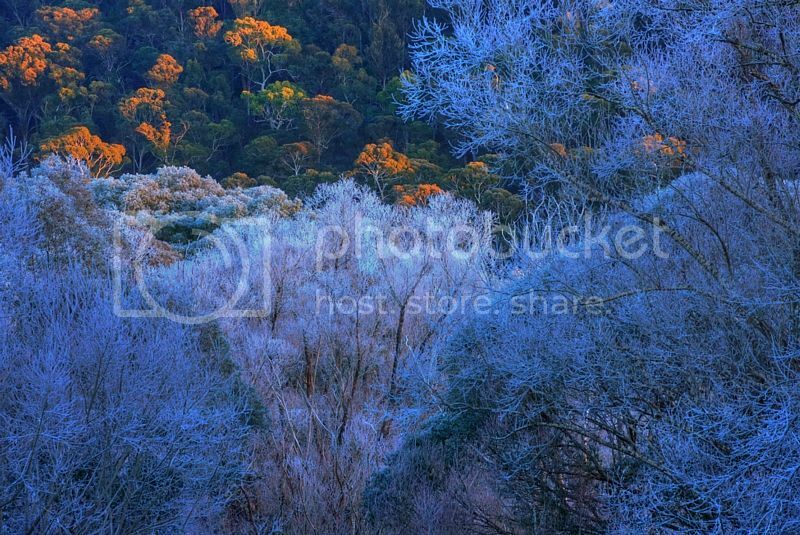 Ice trees, at Waiborough Creek, the Southern Blue Mountains, the BNT. 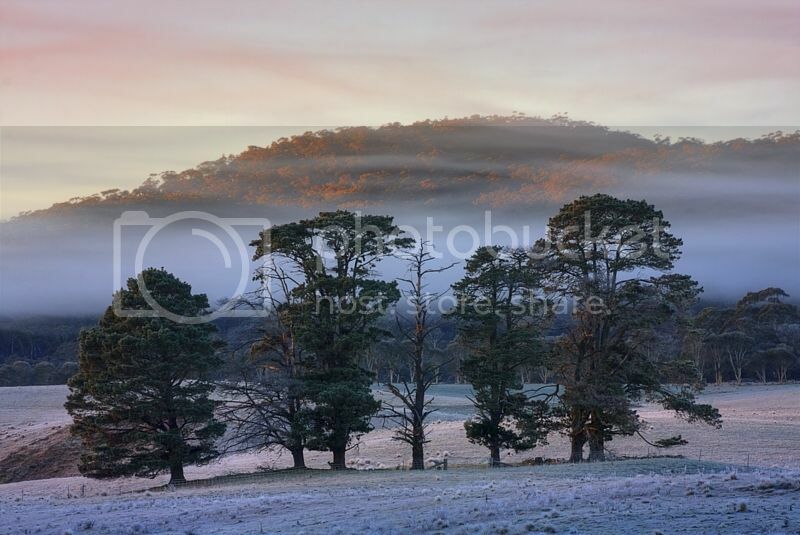 absolutely stunning photos warren - particularly love the frosty one at the end. We camped up high once on a granite top and in the little valley below us in the morning you could see the frost line in the tree tops reaching up the sides of the valley about 10m or so. Winter is such a great time to walk.